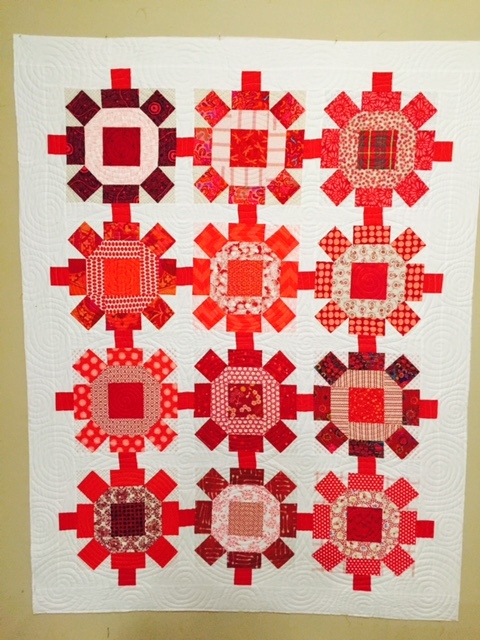 I'm a fan of sampler quilts, so I have been a fan of AnneMarie Chany for a long time. She takes traditional blocks and incorporates them into the most creative settings. 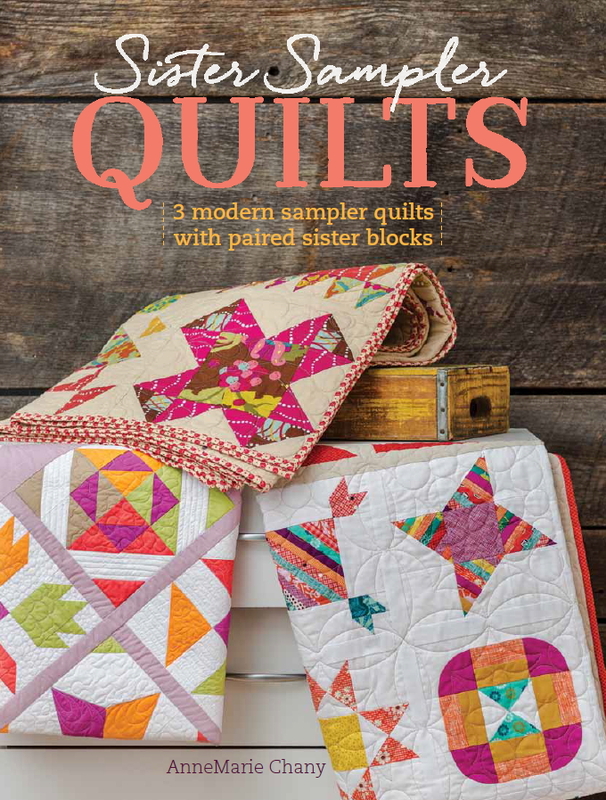 When she asked me to be part of a blog hop to get the word out about her new book, Sister Sampler Quilts, I didn't hesitate for a minute to say yes! 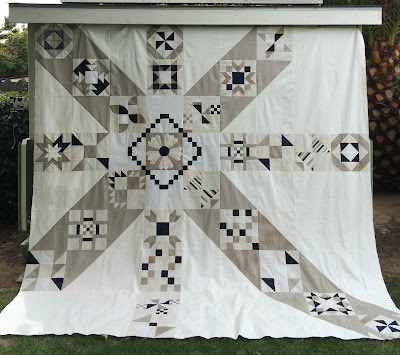 If you have been reading this blog for any length of time, you may be aware that every other year I make a king-sized quilt for an auction where all the proceeds benefit Third World Relief. I chose AnneMarie's Moccasin pattern for the upcoming auction in April. Isn't this an amazing setting? I needed the quilt to be larger than the original pattern, so I included some Vice Versa blocks as well. 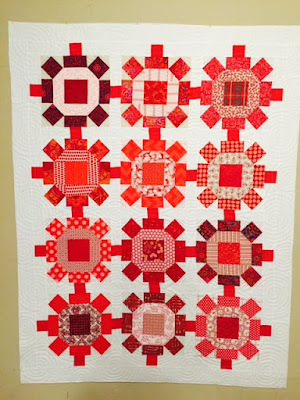 It's being quilted by my husband's cousin--we work in tandem every other year--and I can hardly wait to get it back! I totally "borrowed" the fabric selection from Kristi Owens (@71 stitches on Instagram). She graciously gave me the list of fabrics she had selected and I was able to track nearly all of them down and duplicate the quilt she made. I had originally planned on making the Vice Versa Sampler in shades of blue (before I was totally sidetracked by the Moccasin design! ), and without a doubt, this will be made for an upcoming auction. The premise of Sister Sampler Quilts is that blocks are made in pairs. 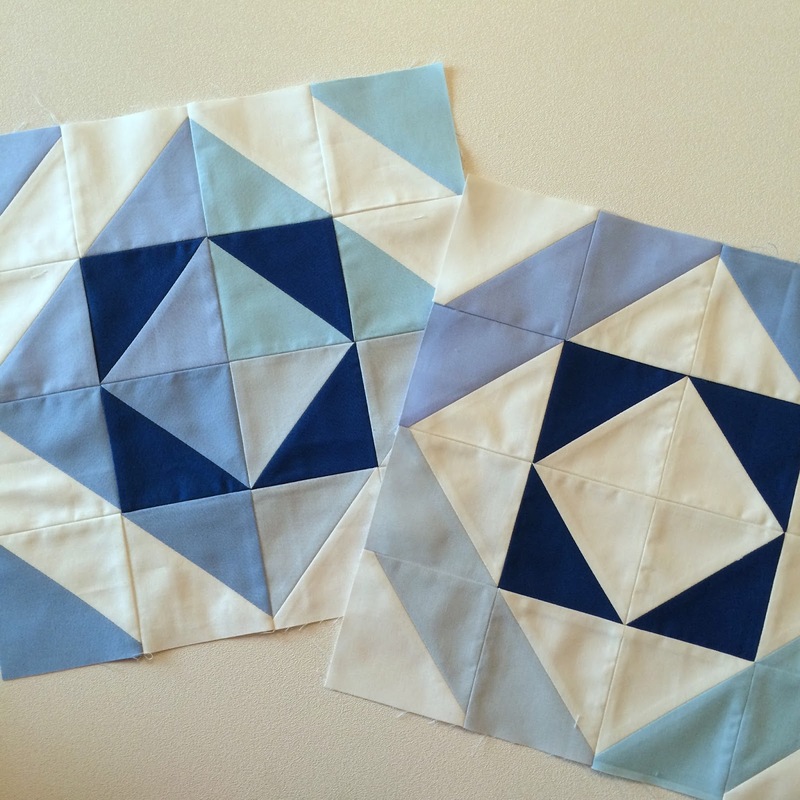 In Sister's Ten Sampler and Bonfire Sampler, the blocks can be the same (identical twins) or made from different fabrics (sisters). However, in the Vice Versa Sampler, one block has the lights, darks and backgrounds in the most common location, while the sister block is just the opposite. I LOVE this concept! 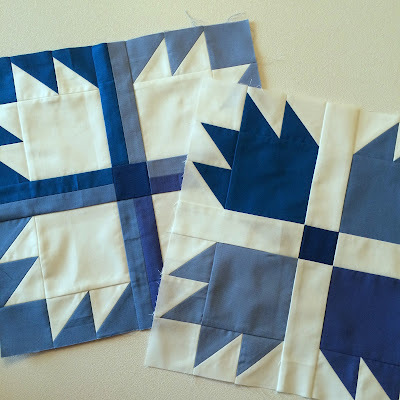 I decided that in addition to showing some blocks from AnneMarie's book, it would be fun to have her play The Name Game for her blog, Gen X Quilters. So here we go. 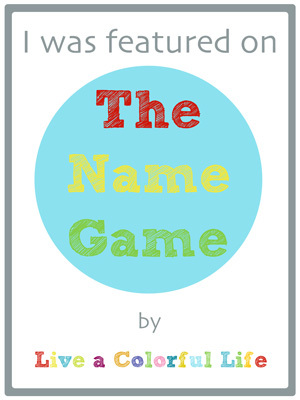 Were the other names you considered? Since most of the beginning of my blog career was done on a whim, I can't say I spent a lot of time brainstorming on a name. I'm more of a jump-in-feet-first kind of person. So I wanted to get writing and sewing right away. 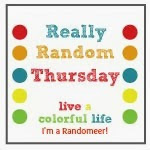 Now that your are recognized by your blog name, are you happy with it? 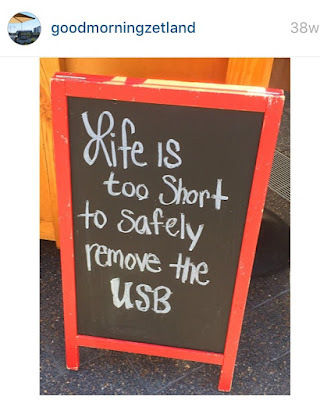 Or do you wish you could change it to something else? Most of the time I'm happy with it. There are days when I wish I chose a prettier, more flowery name. Something cuter and feminine. There are other days where I consider switching to use my own name. 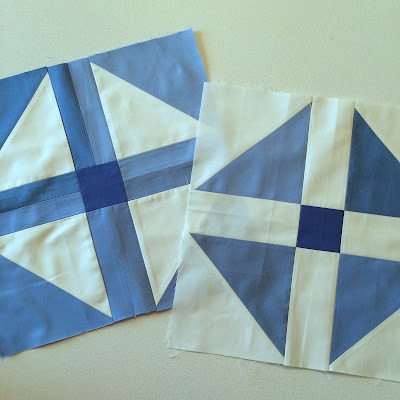 What is the best piece of quilting advice you have received? I found my local long arm quilter in 2010. From the beginning, she encouraged me. 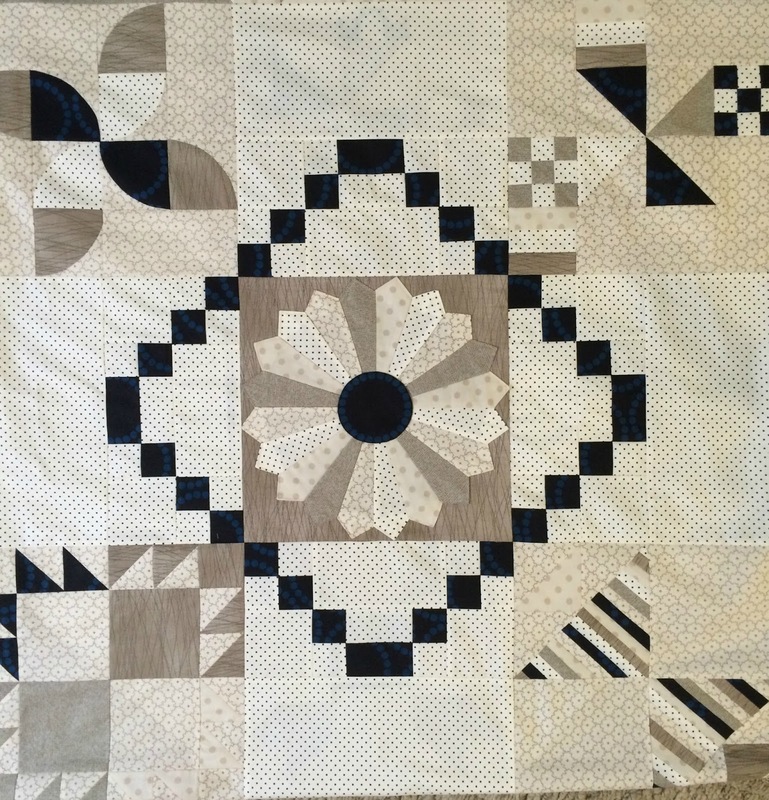 At that time, modern quilting was getting started, but certainly didn't exist locally for me. 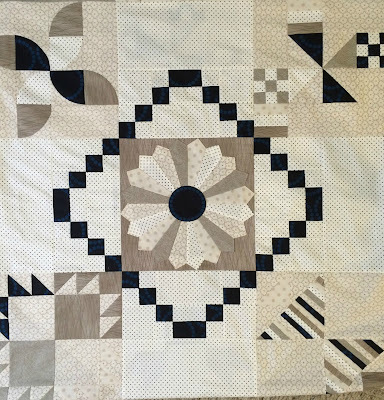 My quilts were always a little bit different from what she normally saw and she encouraged me to pursue something further. I thought she was crazy. I don't think I would have had the guts to showcase my work online without her commentary and advice in the back of my head telling me that my sewing was good enough. I think we naturally doubt ourselves and our abilities. What is your go-to snack food for quilting? Beyond designing, what is your favorite part of making a quilt? Hands down, piecing. I absolutely love to sit at my machine and piece. There is something about watching the blocks take shape that I just love. That and the soothing hum of my sewing machine. I hope you will check out AnneMarie's blog because there is a wealth of information, tutorials, block library. Also check out her new book. 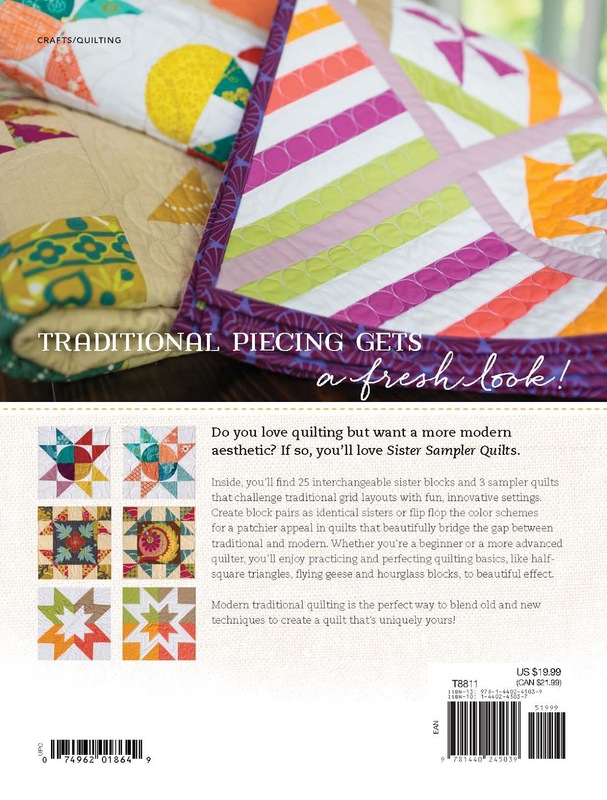 Sister Sampler Quilts is beautifully written, Along with three creative samplers, there are some great tutorials--half square and quarter-square triangles, flying geese, curves, etc. It will make a great addition to your quilting library. If you have missed any of these posts, there is a lot more inspiration so please check them out. 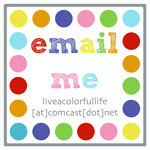 Cindy Wiens / Live A Colorful Life/You are HERE! I'm sure I have mentioned before that I married someone from Minnesota, as did my favorite cousin, Cathy. 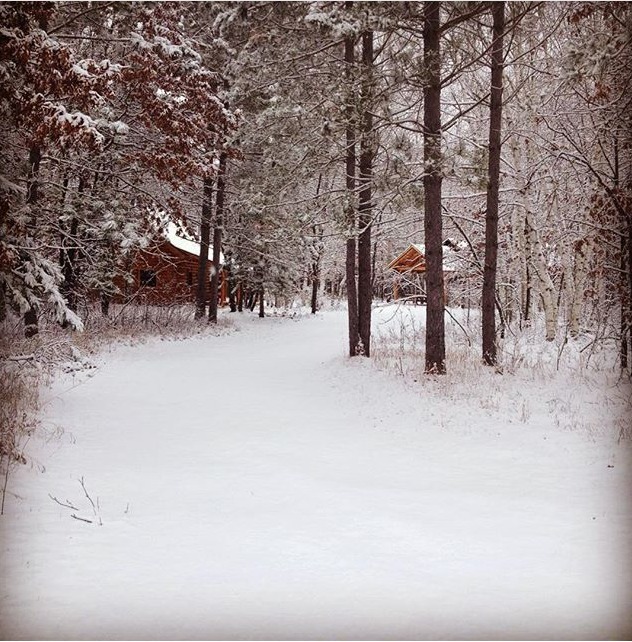 Also, Terry and Cathy have built a beautiful cabin in northern Minnesota. 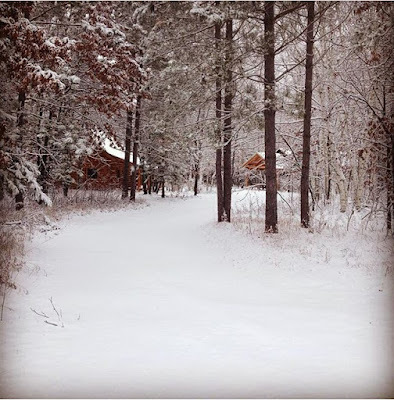 They just returned from spending the holidays at the cabin (with lots of snow and super low temperatures). They brought back a few gifts. Mark would agree that Minnesota is indeed God's country. They also included a hand made magnet in the shape of the state and some wild rice that we are anxious to try. The Trader Joe's bag they brought back from Minnesota certainly has embraced the state as well. In case you need a lesson in local jargon, here you go. Casseroles are always called hot dish. Make sure to take note of this. I think most people who know anything about the state realize that it is the Land of 10,000 Lakes, but here is a little lake trivia. Apparently there are 11,842 lakes. And it's hard to find unique names for that many lakes. While the numbers vary from website to website, there are approximately 201 Mud Lakes, 154 Long Lakes, and 123 Rice Lakes. While I was cleaning out a box a few weeks ago, I found this button. 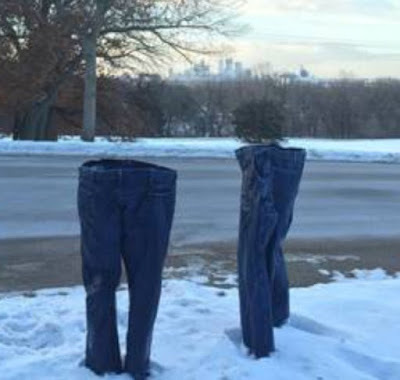 I took the picture on top of our Minnesota kitchen apron. With a name as long as Winnibigoshish, I can see why some of the lakes have much shorter names. But Mark and Terry would undoubtedly both agree with the button. 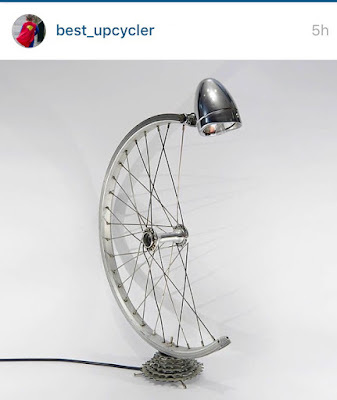 I found this on a super cool Instagram account, and have forwarded the picture to Mark's brother, who lives in St. Paul (keeping with the Minnesota theme this week) and is a cyclist. I'm sure he has the needed parts to make this lamp for me. I hope so, because I have just the spot for it. I love to see our son at work (he makes it on this Minnesota post because his father was born in Minnesota--works for me...). 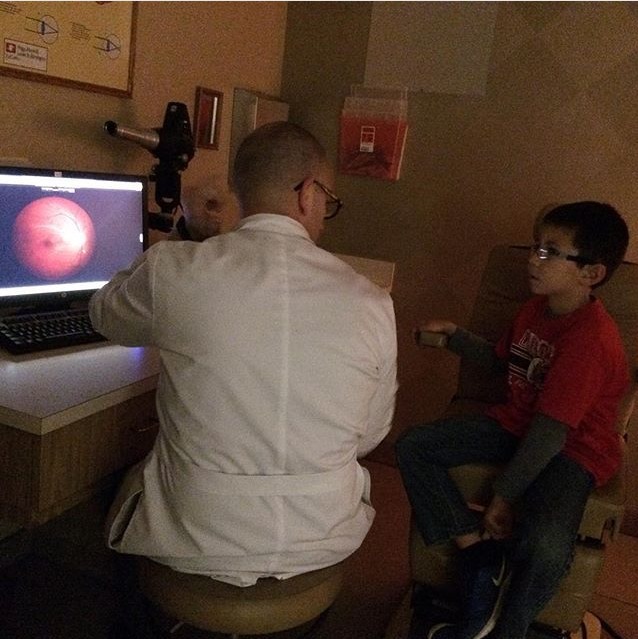 Here he is checking the eyes of the son of good friends--and showing him what the inside of his eye looks like. 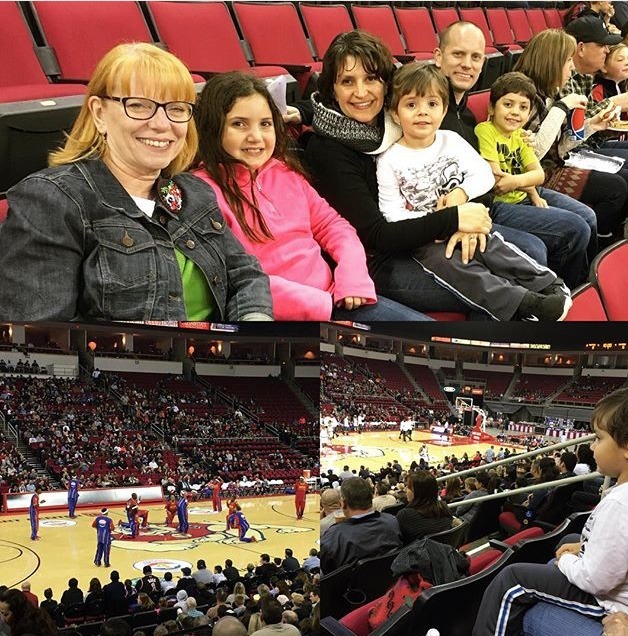 So proud of him, not only at how he excels in his profession, but more importantly the high priority of his family and friends. And lastly, this. 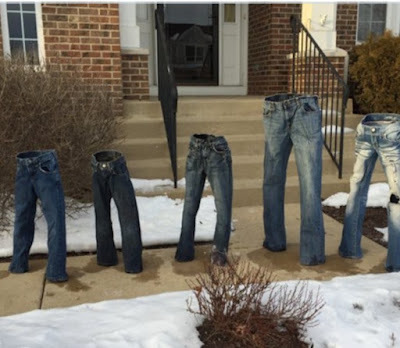 I have only one response: you betcha! !